This is a meditation that I created from a few others and from having a hectic life. It's a simple exercise, but I hope - like some of my favourite meditations - it has a bigger impact than first thought. It's a straight-forward little exercise, but the devil is in the details. Here, I've tried to come up with something that isn't about making it to the end, but about developing a routine, feeling the discipline of flow. The counting is something everyone can do, so there's no special skills involved or needed, just the power of concentration, and a little imagination. 600 circles should technically take 10 minutes. The idea is to imagine a loop circling you with every number and breath; one, breathe, and around you it goes, two, breathe, and around it goes, three and so on. 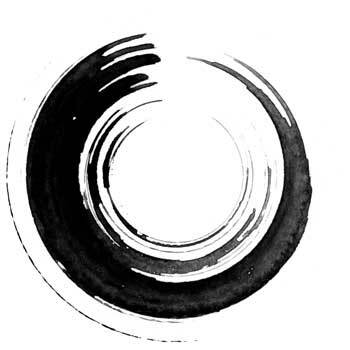 The circling itself can be anything you find soothing and easy to visualise. For me, I like to imagine a little white or blue ball of light whizzing gently around my body. The light spins around me as I breathe, and each number counts as a revolution. Sometimes I like to mix it up and change the visual to a little black and white spotted bee, called leafcutter bees. It buzzes lazily around my head, moving in a swaying motion. Very peaceful. Take some deep breathes to focus. Feel the air go in and out. Trying breathing through your nose and out through your mouth, see if this feels different to just breathing through your mouth. Don't force it, just let your breathing slow and become relaxed. Start to visualise your circling object now; see the little ball of light come into being, watch it bob before your eyes. See a little bee float towards you, hovering about your head, shifting to your breathing. One deep breath in, and as you let it out slowly, begin the first revolution. Firmly imagine your little object circling your body. Does it turn around about head height? Or does it drift around you in a wide, low arc? Does it take its time, or whizz quickly about and come back to the start like a little bullet? Keep counting and breathing. There's no right or wrong way to do this, just that you keep breathing, counting and imagining. And this is where the magic happens; by doing all of these things at once, you are hopefully giving yourself a chance to slow down, be calm, and focus. Little thoughts and worries are allowed to slip in and rouse you, but try to make them brief and let them slip away on the next breath or count. Once the circle passes the origin point, let the last thought go. I need to do this at work tomorrow, orbit, blown away. About that conversation I had with so-and-so, orbit, blown away. I wonder how long I'm taking here... orbit, blown away. Let the rhythm of the cycle lull you. If you are doing this to help you sleep and you start to doze off, great! There's no need to push yourself to 600, trying to stay awake to complete the circuit, you'll just tense yourself awake. If you are using this as an aid to achieve a little much-needed serenity, just remember that it's not about getting to the end, it's about looking for the flow and enjoying the mental peace. Personally, I need lot of mental stimulation. I sometimes have a low tedium threshold and my mind likes to be entertained. I'm able to do this myself, but without practise, I lose focus and get irritated by worries. Taking the time out to slow down, look around me, see pretty things, gentle my breathing, and count the moments; all this gives me a chance to unwind, unclench and settle. While you breathe and count and whirl, try not to forget this. You may be on the way to work, you may be on the way to bed. You may just have decided to take some time out in the day for yourself. But this meditation is something you do for yourself, a little space you carve out for inward reflection. Once you lose count or focus entirely, stop. Again, this isn't a race and it isn't about finishing. Mark the number you got up to and take a moment to think about why you lost count or focus. Were outside influences just too distracting? Were you just too tense and kept jumping back and forth between numbers? Did you fall asleep or just drift off peacefully? If this happened, then consider it a win. It's all about the chill factor, and if you mellowed yourself out so much you faded off a bit, you've still done yourself a good deed. 600 is a special number, all multiples of 3 and pretty rounded curves, a spiral in a number. The higher, quietly cheeky, message here is to feel the greater circle of life and constant motion. We've talked about this before, yes? Constant motion isn't about speed, it's about growing and evolving. Take a little time for yourself occasionally and turn inward, watch that amazing process and enjoy.